RNA differs from DNA in three aspects. First, the backbone of RNA contains ribose rather than 2’-deoxyribose. 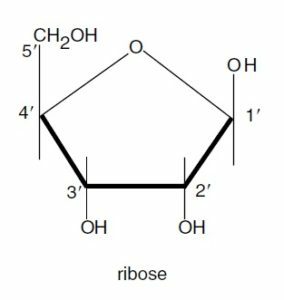 That is, ribose has a hydroxyl group at the 2’-position. Second, RNA contains uracil in place of thymine. Uracil has the same single-ringed structure as thymine, except that it lacks the 5’-methyl group. Thymine is in effect 5’-methyl-uracil. Third, RNA is usually found as a single polynucleotide chain. Except for the case of certain viruses, RNA is not the genetic material and does not need to be capable of serving as a template for its own replication. This slight difference has a powerful effect on some properties of the RNA molecule, especially on its stability. For example, RNA is destroyed under alkaline conditions while DNA is stable. Although the DNA strands will separate, they will remain intact and capable of renaturation when the pH is lowered again. However, under such conditions, RNA will quickly be destroyed. It is usually described as single stranded, but only because the complementary strand is not normally made. There is nothing inherent in the structure of RNA that prevents it forming a double-stranded structure: an RNA strand will pair with (hybridize to) a complementary RNA strand, or with a complementary strand of DNA. Even a single strand of RNA will fold back on itself to form double stranded regions. In particular, transfer RNA (tRNA), and ribosomal RNA (rRNA) both form complex patterns of base-paired regions. The molecular formula of phosphoric acid is H3PO4. It contains 3 monovalent hydroxyl groups and a divalent oxygen atom, all linked to the pentavalent phosphorus atom. It contains D-ribose, hence the name ribose nucleic acid or ribouncleic acid. This sugars in nucleic acids are present in the furanose form and are of β configuration. Ribose reacts with orcinol in hydrochloric acid solution containing ferric chloride. Uracil (C4H4O2N2), found in RNA molecules only, is a white, crystalline pyrimidine base with MW = 112.10 daltons and a m.p. 338°C. Cytosine (C4H5ON3), found in both RNA and DNA, is a white crystalline substance, with MW = 111.12 daltons and a m.p. 320-325°C. Adenine (C5H5N5), found in both RNA and DNA, is a white crystalline purine base, with MW = 135.15 daltons and a m.p. 360-365°C. Guanine (C5H5ON5), also found in both RNA and DNA, is a colourless, insoluble crystalline substance, with MW = 151.15 daltons.